“You are always welcome here,” my mother reminds me as I haul in boxes of my possessions. I know that she’s telling the truth, but I also know that she doesn’t really have the room for her son who’s already moved out once and tried to expand his life. Even so, losing housing at the church with a part-time job and unreliable school schedule basically eliminated my other options. I feel like a failure. Night In The Woods is an adventure game three years in the making, following a successful Kickstarter campaign and dedicated fan following. The story takes place in Possum Springs, a town that could basically be Small Rural Town, U.S.A. You play as Mae Borowski, a twenty-something woman moving back home from college for nondescript reasons. Having been away for some time, Mae now must settle back into small town life and reconnect with her family and her friends, a task that turns out to be easier said than done given Mae’s personality. Also, everyone in this game is an anthropomorphic animal character. 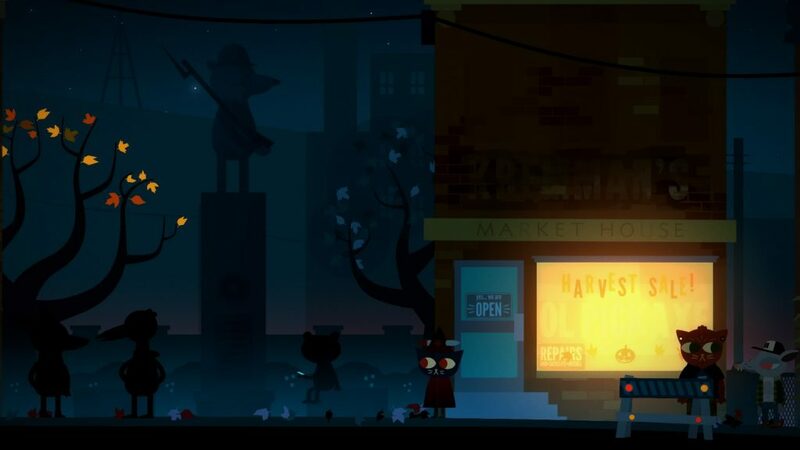 A majority of your time with Night In The Woods centers around this, with Mae going out to explore Possum Springs and interact with the various townsfolk. 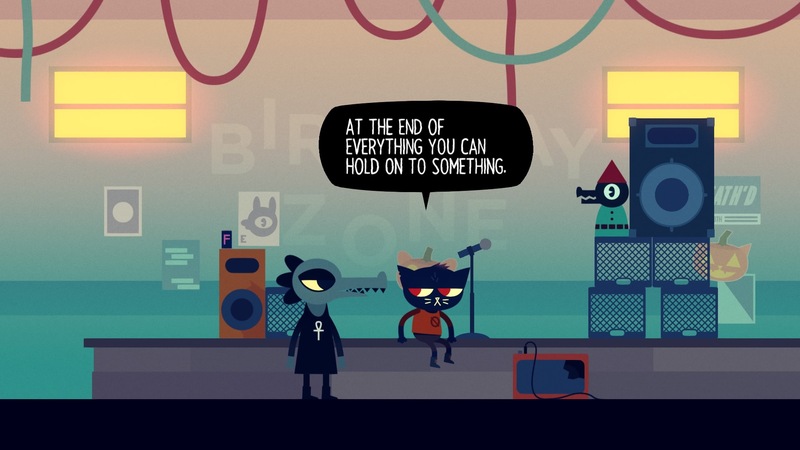 While there is an exploration element to the game-as a cat, Mae is capable of accessing hidden areas, for example, a majority of time is spent talking to other characters or no one at all. Since this is a pillar of the game, characters can only be interacted with when they have something to say. Early on, a lot of what they have to say questions Mae and why she’s back. She’s not interested in talking about it. It’s been a couple of years, and the anger of being sent the equivalent of back in time has worn off. There’s still hesitation, a lot of it coming from the way people have started to shift in talking. I’m hearing a lot more about the perceived failures of the government and a whole lot about ways of life being threatened. A lot of the time, I don’t see it. Sometimes, I just played along because I didn’t want to be ostracized more for not being useful. Other times, I didn’t notice. We didn’t really have class much. Even though I told myself I was doing what I wanted to, secretly I doubted my choices. Mae’s friends make up most of the main cast. Some are glad to see her back in town, others less so. Adventuring with them is what actually progresses both the main plot and everyone’s individual arcs. Often, we’re taken outside of the city for adventures and will often see these facilitated by mini-games meant to add more interactivity to events. Where other narrative-driven games add such things for fear of being called “not a game,” here they feel like reasonable extensions of the main game. None of these mini-games are difficult really, but some do have a bit more of learning curve that you might not get the hang of the first time. Through these events, we come to learn a lot about where all of these folks have come from, and where they aren’t going. Unsurprisingly, living in a coal-mining town in this day and age isn’t exactly great for attracting opportunity, and it becomes increasingly clear that Night In The Woods is about being a millennial in a world that doesn’t know what the hell to do with you. Many of the young adults in Possum Springs carry heavy weights on their hearts, often as the result of circumstance or their own actions. Others simply have no motivation at all, they’ve given up on ever leaving the town or making something of themselves at all. Several of them fall into the LGBTQ+ spectrum, with at least one possibly being asexual. Relationships with their family members are strained often. But it isn’t just those damn millennials that get all the attention. The other residents of Possum Springs get their fair share of development and concern. Given the town’s implicit history, its is a fairly conservative town (though, thankfully, not that kind of conservative) and its residents are feeling the hit too. Mae discovers that her parents have put themselves in quite a bit of debt in order for her to be “the first to go to college.” She’ll often pass the town council talking about the need to bring back businesses and/or jobs in order to “save the town.” That same town council puts a wrench in the humanitarian efforts of the new pastor of the local church, who notably refers to God with ‘they’ pronouns. While all of this is going on, Mae discovers that there may be a murderer in their midst, and they might not be mortal. 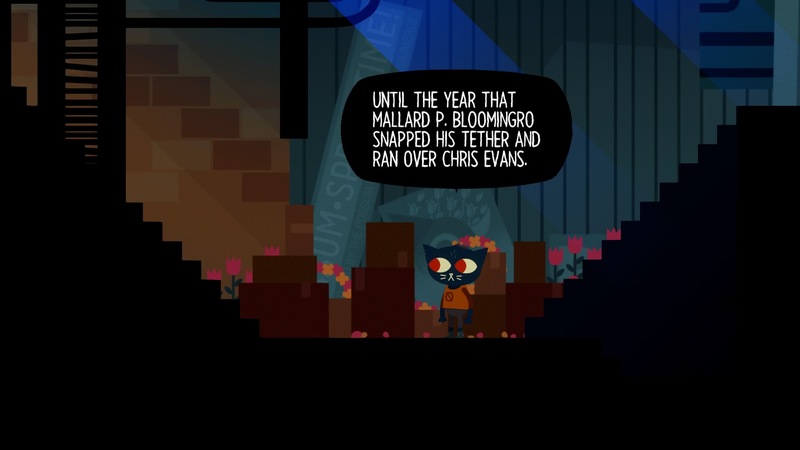 Some people aren’t going to like the way Night In The Woods chooses to unfold its story. A lot of the time will be spent wondering Possum Springs, and while some sections of the town will only be accessible later on, eventually everything becomes laid bare. True to the implication before, there really isn’t much going on in the town. For myself, the intimacy shown by the character interaction fills in the blanks. I couldn’t help but travel from edge to edge of the town every time the day cycled, out of fear of missing more of a conversation or a storyline. 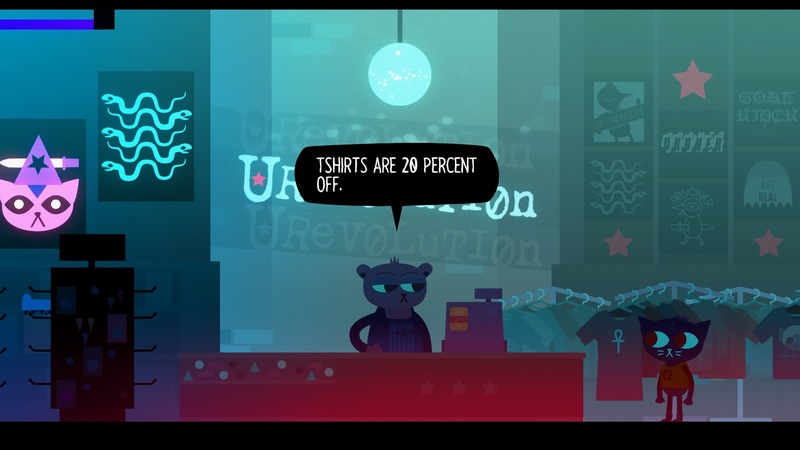 While yes, everyone is an animal, Night In The Woods avoids making puns or jokes at the expense of the narrative. No Zootopia style gags here. In fact, I’d say most of the cast of the game is more human and have more personality than actual humans in other games. If anything, the anthropomorphic motif is used to lower the audience’s guard and tell a more impacting story. The central mystery does take some time to pick up, admittedly. The game is far more interested in the themes and motifs it truly wants to explore. In spite of this, the themes do actually manage to converge back on that mystery in a way that is satisfying, even if you will likely figure it out beforehand. Despite managing to nail it on the nose myself, the fact that Night In The Woods actually went for the the ending that it did surprise me. 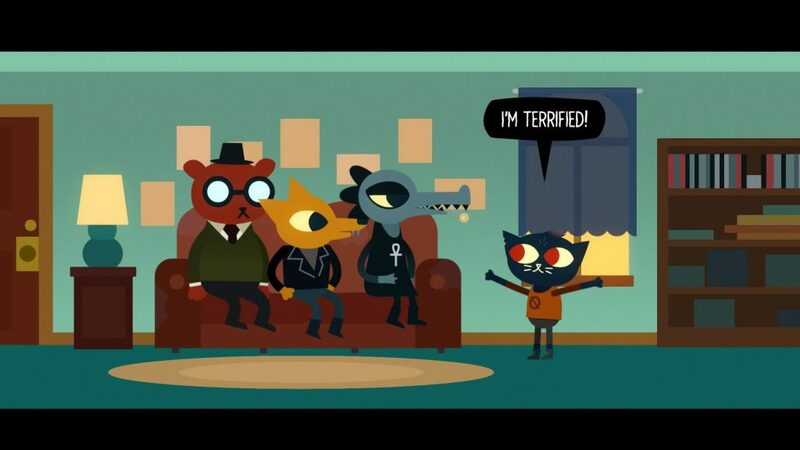 For a game so grounded, the reveal at the end-which is indeed the titular night in the woods-almost feels like too high of a concept, and again may not sit well for everyone. I loved it, personally, and felt it tied the bow quite nicely. And yes, it’s worth not being spoiled. The fact that they actually go for it is almost unbelievable. I’m sitting on the bathtub floor while the hot shower water runs over me. A part of me wants to cry, but I just can’t muster the emotion. My mind keeps going back to the email I received, the old church told the new church about the feminism piece my wife shared around. The reason we left. They didn’t know that I’m the one who showed to her. My skin is getting wrinkly, I’ve been in here for a while, unmoving. Inside my head, my world is spinning. I’m seeing everything differently. I realize, in this moment, that I don’t belong there. I probably never belonged there. I don’t know if I belong anywhere. I kind of don’t care. 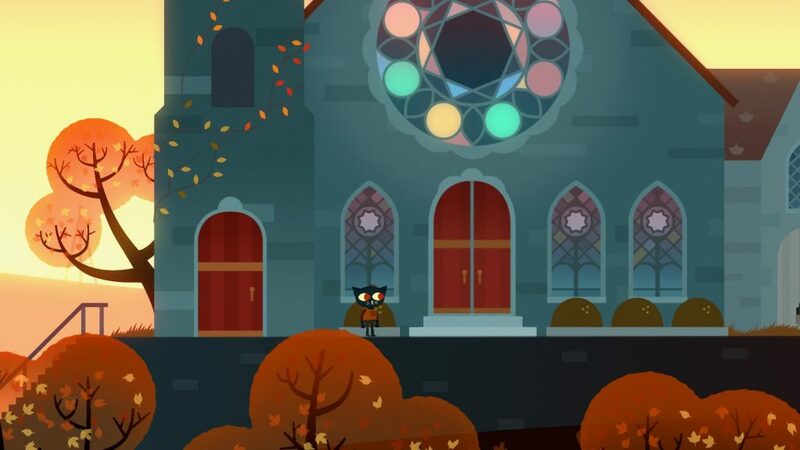 As a whole, Night In The Woods is a meditation on disillusionment. While this is generally associated with the millennial generation, I’m not sure myself that it’s age-specific, and this game makes a pretty strong case for the same. However, Night In The Woods also realizes that there isn’t a single, if any, good way to break it. If anything, the game feels like an acknowledgment that not only does disillusionment happen, it can happen and be a net good, depending on how it is handled. The advocation here is for healing and moving forward, seeking help and good influence, even if you yourself are not a perfect one. Mae shoplifts, is awkward in public situations, jobless, not healthy, and unsure. She’s also determined and cares about her friends and her town. You will see glimpses of yourself in this game. You might not like what you’ll find. But you will enjoy it. It isn’t a spoiler to say that the final word in Night In The Woods is “Decent.” However, Night In The Woods is far more than decent. It’s the best game I’ve played in 2017, and there’s already been a lot of good games in 2017. Yet, Night In The Woods was more than even that to me. I was deeply and personally impacted by this game, in a way I always say games are capable of but many never achieve. Previous ArticleTV Review: Riverdale 1x05 "Chapter Five: Heart of Darkness"